Brodie is an 18-month-old Siberian Husky that is full of life! This extremely handsome boy is a ball of energy and stays in full play mode. He definitely will benefit from being placed in an active household with other canine playmates and a family that loves to exercise. Brodie loves dog scootering and biking. Brodie has a wonderful personality and is quickly learning basic manners. He walks like a gentleman on a leash, is crate trained and is trustworthy home alone for short periods of times (which is being expanded slowly). He is very talkative and will greet you with his “happy howl”. 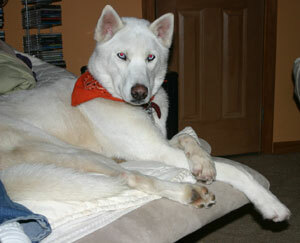 He can be very respectful (for a husky) and loves people and dogs. If you are looking for a fun fellow that will keep you active and fit, Brodie could be the pup for you!